“The Fifth Amendment of the US constitution holds that private property cannot be taken without due compensation. All well and good. But what if a property owner does not wish to sell at any cost? “This fine, wide-ranging overview recounts the intimate stories of regular families versus well-funded corporations seeking to acquire properties of private individuals who refuse to sell. This is an ancient conflict. It reaches back to the very roots of civilization, pitting peasants against kings and, in our time, corporations against people, but Mansfield manages to portray the complex legal wrangling that is common to such issues while at the same time capturing the personal stress that cases of this sort evoke. Howard Mansfield is up to his usual tricks, framing an old familiar topic in a wholly new way. This time around, the acclaimed preservationist and author of ten books devotes himself to the concepts of land and property. In another writer’s hands, this might be fodder for a dry, academic tome. Not so in this compact, colorful exploration. For Mansfield, property is the bedrock of American life. It reflects our nation’s individualism and its enterprise, the never-ending battle between people and progress. The Habit of Turning the World Upside Down is an eye-opener, as it considers the myriad ways in which land – its ownership, parceling out and sundry uses – pervades every nook and cranny of our country’s development. … Mansfield’s lyrical narrative is both urgent and humane. The always eloquent Mansfield conducts an evocative foray into the history of American property rights in this slim but enormously prescient title. In a series of related essays, he takes readers from the arrival of the Europeans (who “defined the Indians by what they didn’t own”) to George Washington’s land speculation career with the Adventurers for Draining the Dismal Swamp (a slave-labor-based company attempting to drain a Virginia swamp) to contemporary struggles defending private property rights against pipeline and transmission line developers. While he crafts strikingly evocative portraits of the people he profiles (his essay on farmer Romaine Tenney, who sacrificed everything to fight against the interstate barreling across his land, is simply unforgettable), it is the scalpel like precision with which Mansfield homes in on the relationship between Americans and the land that proves most perceptive. He accepts all the complexities of his chosen subject yet is gifted with an unerring eye for the true heart of the matter. “American property is always in motion,” he writes, but it is also “our anchor and our North Star.” Who decides the best use of property? Who truly owns it? Powerful insights live on these pages, and Mansfield’s observations matter now more than ever. There comes a point early on in the reading of Howard Mansfield’s newest book The Habit of Turning the World Upside Down when you realize that you thought you understood what “property” meant, but in actuality, you didn’t. A point when you say to yourself: “Ok, I’m listening to what this guy has to say.” This book is a path-clearing work; the idea of property as most of us understand it has been occluded by so many branches consisting of conflicting ideas, legalese, lawsuits and the idea of eminent domain that one needs a person like Mr. Mansfield to clear away the brush and show us the path again. He does this admirably well in this, his tenth book. I’ve written about a number of Howard Mansfield’s books over the years here at bookconscious. 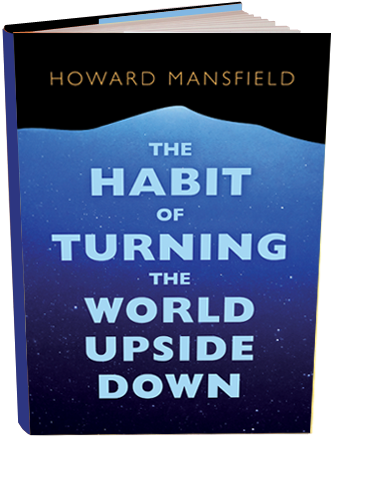 Today on the bus back and forth to Boston I finished his latest, The Habit of Turning the World Upside Down, and I’m pleased to report that like all of his writing, it is both a delightful read and one that will leave you better informed and perhaps pensive. Mansfield has the gift of writing both clearly and intellectually. His topic this time is property, particularly the American concept of property as “the rock-solid part of our creed of individualism.” From the colonies to climate change, Mansfield traces the ways we’ve sought, fought over, bought or taken land, and how we associate land with identity and progress…. The Habit of Turning the World Upside Down is an eloquent and occasionally heartbreaking exploration of the American notion of property, a deep dive into how something we take for granted today—the ownership of land—is infinitely more complex. I appreciate especially the historical look at how our legal system, which gives priority to the “exuberantly active” citizen over the quiet one, has shaped everything from the government’s disastrous interactions with indigenous peoples (who had a very different relationship to their land) to eminent domain property seizures that are leaving homeowners feeling robbed and defeated, and to the changing boundaries of our land itself as it is already, slowly, quietly, inexorably being altered by a changing climate. I’ll join in his lament that our laws favor corporations over individuals, “progress” over stewardship. This is the first book I’ve read by Mansfield, and I found it probing and beautifully written, and also deeply caring. A collection of themed essays rather than an overarching narrative or argument, this book gave me so much to think about. After finishing it, I am carrying about with me Mansfield’s concluding metaphor that draws on a Buddhist notion of impermanence. This is a long view we need to hear and see more often. It was a pleasure to be in Mansfield’s intelligent company, and I look forward to reading other of his books. This is a well-researched and passionate exploration into the history of American property rights. The precision with which the author homes in on the relationship between Americans and the land is fascinating. Who decides the best use of property? Who truly owns it? “Pay attention to the stories of individuals courageously fighting in The Habit of Turning the World Upside Down.